The most reliable method for measuring the nutrient levels in COCO is using the 1: 1.5 extraction method. EC and pH of the root environment can be determined by using this method. The pHand EC of the drain water generally deviates from the actual root situation, as COCO is able to retain and release elements. Take a sample of COCO from the slabs or pots (photo 1). 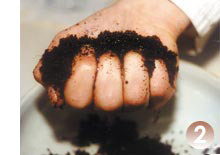 This can be done with a soil core sampler or a trowel. 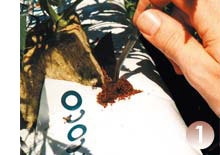 To get a representative sample the COCO must be collected from as many places as possible. Collect the sample in a bowl and determine whether it contains the right amount of moisture. The COCO has the right amount of moisture if moisture disappears between your fingers when you squeeze it (photo 2). Add de-mineralized water if necessary and mix the COCO. Take a 250 ml measuring jug and fill it with 150 ml of de-mineralized water. Add COCO to the 250 ml mark (photo3). Fully mix and allow the slurry to settle for at least two hours. 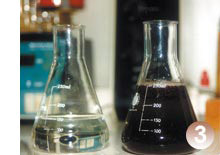 Mix again and measure the pH. Then filter this material and measure the EC. A 1:1.5 analysis can best be done after 3 to 4 weeks. The target values for EC are between 1.1 and 1.3, for the pH, between 5.5 and 6.2. Very high EC values increase the risk of burning symptoms. To limit the risk of burning symptoms, the COCO can be rinsed with acidified water containing Coco A/B nutrient at an EC of 0.65 (pH 5.8).